Who doesn't love a pudding cake? Walk through the bakery section of your local grocery store, and you'll see whole pudding cakes in assorted flavors and for those watching their weight . . . they'll even sell you one-half of a pudding cake! They do look tempting! But, as we all know, nothing beats a homemade pudding cake! 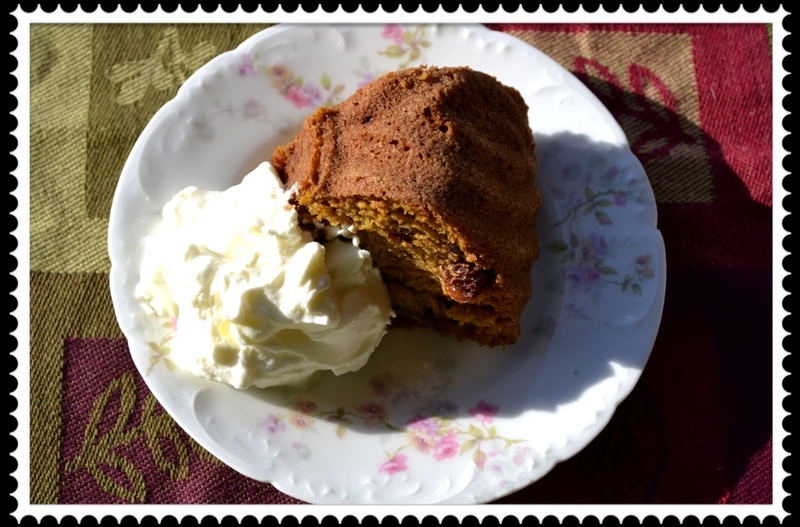 I have a moist, sweetly spiced, Pumpkin Pudding Cake recipe you're gonna love, and come back to, over and over again! Being a Midwestern girl, Farm Journal Magazine and an assortment of Farm Journal cookbooks were leafed through often to find that perfect recipe! Many of my tried and true recipes through 40+ years of marriage have their origin in a Farm Journal cookbook! I love recipes with history, recipes passed down from one generation to the next. This recipe was adapted from The Farm Journal's Country Cookbook revised, enlarged edition 1972. Their original cookbook was published in 1959 . . . A compilation of recipes from 1947 - 1959 and then updated for the "modern woman"! The "Dog Days of Summer" are fading . . . FALL is upon us, and it's time to get baking! 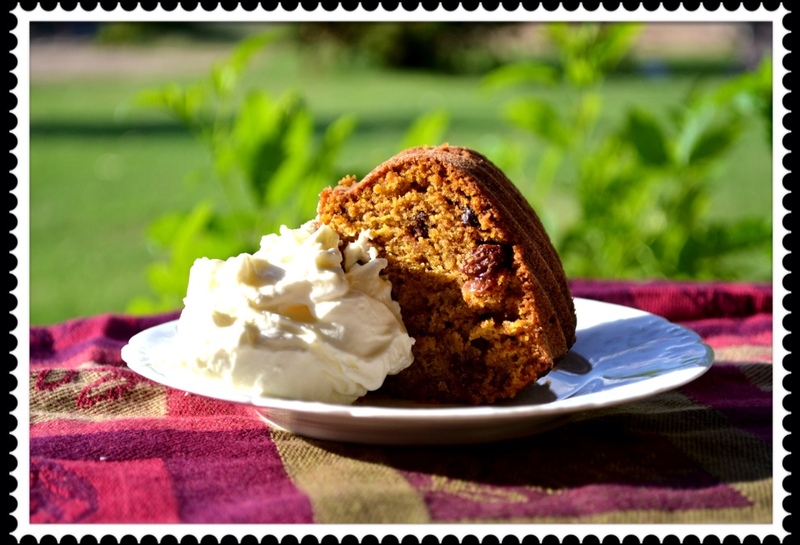 Raisin-studded Puddin' Cake with a side of whipped cream . . . Using a fine sieve ~ work all the dry ingredients through into a large mixing bowl; whisk together. Add lard/butter, pumpkin and water; beat on medium speed with an electric mixer or until ingredients are all well mixed. Add egg, beat 2 minutes longer. Stir in plumped* raisins and optional nuts. Pour into a 1 1/2 quart ring or Turk's head mold that has been well buttered and lightly floured. Bake in a moderate oven (350F) about 45 minutes, or until cake tests done with a wooden toothpick. * To plump raisins, place raisins in a microwave safe measuring cup, add 2 teaspoons of water and microwave on high for 30 seconds. Allow raisins to steam under plastic wrap for 2 minutes; drain off any liquids. 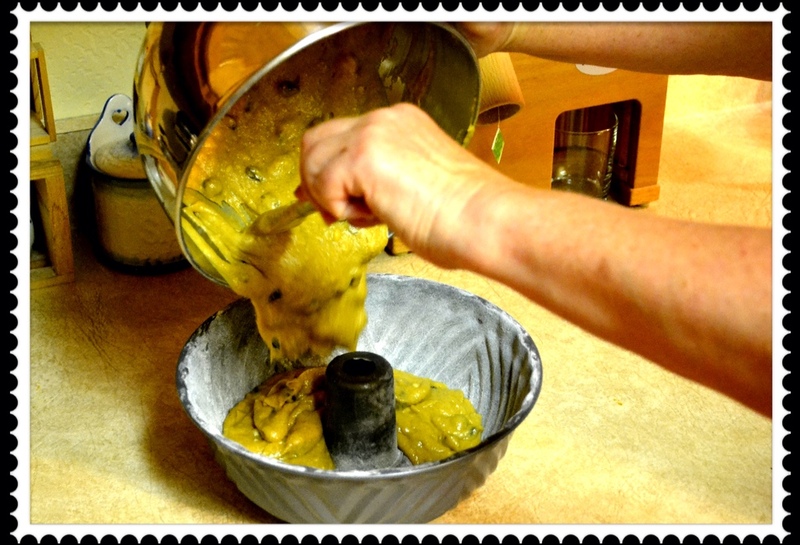 Pour cake batter into a buttered and floured tube pan. Cake always tastes better on a delicate, antique Haviland dessert plate! 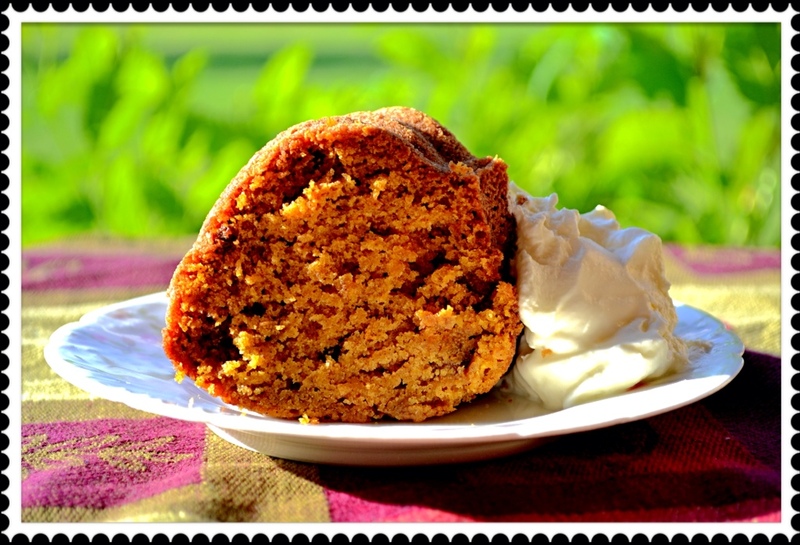 Moist, decadent, Pumpkin Puddin' Cake . . . Oh Baby!!! They say, "A picture is worth a thousand words", but who wants to talk when you can eat cake? Did I tell you I just love Fall? I love the crisp mornings, windows open, birds singing, and the house filled with the aroma of fresh pumpkin and sweet spices . . . Over at Julie's!! !